College: LSU (Louisiana State University). Team: Boston Celtics, Orlando Magic. Insert: Rookie Relics Autograph (auto rookie card featuring two jersey swatches and a big patch swatch). 2006-07 Topps Triple Threads Relics Autographs. About Hockey Card World:We have been in business since 1987 and carry Sports Cards and memorabilia. We deal with both companies such as Upper Deck and Panini. 2010-11 Panini Threads Triple Threat Materials Prime Steve Nash #10 15/50. 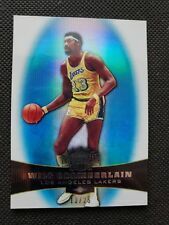 This is a 1/1 on Ebay and a nice 2-color jersey card of one of the legendary PGs in NBA history. The card appears at least NM-MT to me. I am not a professional grader so look for yourself. I will be selling off many cards from my personal collection over the next few months so keep checking back for more. Autos, materials, relics, Jordan cards, and more are coming Shipped with USPS First Class Package. Player: Tony Parker. Year: 2006. Attributes: Serial Numbered. Team: San Antonio Spurs. Player: Ben Gordon. Year: 2007. Attributes: Serial Numbered. JERSEY NUMBER #13! MAYBE ONE OF ONE?. NO EXCEPTIONS! Amazing card, Only 25 made! Buy it now, before it's gone! Team: Boston Celtics. Year: 2006. 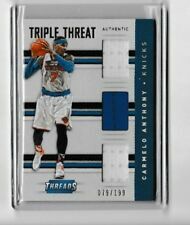 2015-16 Panini Threads Triple Threat Trey Burke 097/199 Jersey Card! You are bidding on the cards listed in the title/pictured: Up for grabs is a 2015-16 Panini Threads Triple Threat Trey Burke 097/199 Game-Worn Jersey Card! Awesome card and is in NRMT/MINT condition! If you need any additional information or more pictures, please do not hesitate to contact me. PayPal accepted only. US shipping only. Payment is due within 3 days of auctions end. If you need additional time, please contact me! I will ship card within 24 hours of received payment. *Will ship on Monday if purchased on the weekend* Card will be shipped securely in top loader, in a bubble mailer. I treat the card how I would want someone to treat mine. Good luck! Series: Triple Threads. Print Run: 36. Card Attributes: Serial Numbered,Autograph,Piece of Authentic. Product: Single-Insert. Season: 2006-07. CARD #TTRC-47! VERY RARE! This card has never been listed before! From my personal collection. Muti color patch! Beautiful card, Only 18 made! Buy it now, before it's gone! NO EXCEPTIONS! This card includes an authenticated autograph and pieces of NBA player worn materials of Randy Foye. The card number is 119. This card is NUMBERED 22 OUT OF ONLY 50! This card is in NEAR MINT TO MINT condition. This is such a beautiful card of three of the greatest players in NBA history. A total gem, this card is a must for any NBA fan. 2012-13 Panini Threads PRIME TRIPLE PATCH KAMAN, HAWES, BRAND 01/25 - WOW! Player: Udonis Haslem. Year: 2007. Item Condition: Near Mint/Mint. SetType: Main. Sport: Basketball. 2007-08 Topps Triple Threads Relic Autograph #TTRA28 Corey Maggette 6/9 Condition is Like New. Shipped with USPS First Class Package. SP CAVALIERS! VERY RARE! Beautiful card, only 99 made! Buy it now, before it's gone! NO EXCEPTIONS! Player: Chris Paul. Year: 2006. Attributes: Serial Numbered. Year: 2006. Attributes: Serial Numbered. Team: Minnesota Timberwolves. Player: T.J. Ford. Year: 2006. Attributes: Serial Numbered. Team: Toronto Raptors. Player: Morris Peterson. Year: 2006. Attributes: Serial Numbered. Team: Toronto Raptors. This card is NUMBER 15 OUT OF ONLY 66 MADE! The card is in NEAR MINT TO MINT condition. Player: Dwight Howard. Year: 2006. Attributes: Serial Numbered. Team: Orlando Magic. Player: Chris Bosh. Year: 2006. Attributes: Serial Numbered. Team: Toronto Raptors. Player: Eddy Curry. Year: 2006. Attributes: Serial Numbered. Team: New York Knicks. 2007 TRIPLE THREADS BEN GORDAN TRIPLE JERSEY AUTO #ERD 8/36 SUPER NICE, CARD IS NICE SHIPPING TO US 2.50 TO CANADA 3.00,CARDS WILL BE MAILED FAST AND SAFE BUBBLE ENVELOPE. .PLEASE LET ME NO WAY OF PAYMENT AFTER YOU BUY IT THANKS AND GOOD LUCK!!!!! The above card is received as pictured. Player: Chris Paul. Year: 2007. Attributes: Serial Numbered.